Caster Semenya perched herself on a lane marker behind the start of the 800 meters and took a few moments to absorb what it feels like to be an Olympian. She took some deep breaths, then got up, walked to the stagger start and went straight to work. 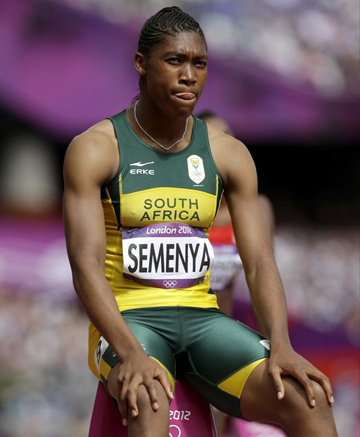 Making her Olympic debut three years after being forced to undergo gender tests that cast doubt over her future in track and field, Semenya finished second in her preliminary heat on Wednesday morning. The 80,000-seat stadium was almost full, but she’s used to big crowds. The whole experience, though, was something new. This is the Semenya of 2012 — she’s 21 and she’s reserved, almost guarded, and generally restricts her public comments to topics of competition. She was still a teenager when she had no choice but to endure having her most intimate details debated and discussed in the global media. Semenya was sidelined for 11 months — while track and field’s governing body decided whether or not to allow her to compete — after she won the 2009 world title at age 18, posting a stunning time of 1 minute, 55.45 seconds. She was tested and eventually cleared to compete in 2010, but she struggled with a back problem for a while before returning to the world championships at Daegu and winning a silver medal. The backing she has from the South African federation was in evidence when she was selected to carry the flag at the opening ceremonies at the London Games, where she’s a genuine medal contender. And she wants to return the support. She will find a fierce rival in defending champion Pamela Jelimo. She said she feels for Semenya, but she has a title to defend and is fit to retain it. Semenya ran her heat in 2:00.71, finishing just behind the 2:00.47 run by American Alysia Johnson Montano, the fastest qualifier from the preliminaries. Jelimo won her heat in 2:00.54 to advance with the second-fastest time. Semenya ran a controlled race, hanging back with the pack while Montano went out quickly, then relying on a late kick to cut down the gap and secure the second automatic qualifying spot from the heat. She knows she has to run a sub-2 minutes to be competitive, and appeared to have a lot in reserve after her opening run in the first of the 800 heats. And even though she’s only new to the Olympic scene, Semenya has recruited a coach with almost unsurpassed experience in Maria Mutola, who retired in 2008 with an Olympic gold medal and three world titles to her credit. Mutola was among those who tabbed Semenya to break the world record when the young South African burst onto the international scene in 2009. Now they’re working together to achieve it. And while there’s still plenty of public attention on Semenya, her presence is simple for other athletes to quantify. Like other athletes in the 800, Smith wanted to leave the gender issue to the experts.